Scientists say a boom in development in the Western Ghats mountains contributed to the disaster that has killed almost 500 people. 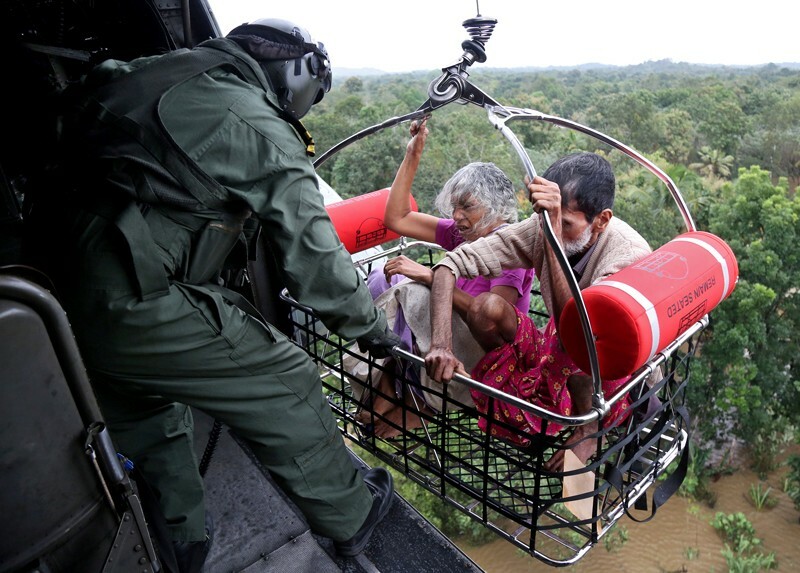 Torrential rains pounded southwest India in August, triggering devastating floods in the state of Kerala that have so far killed at least 483 people and forced hundreds of thousands from their homes. The monsoon rains have been heavier than usual, but scientists say that outdated dam-management systems and increasing mining and development in the Western Ghats mountain range — a biodiversity hotspot that ecologists are trying to conserve — exacerbated the disaster. Kerala received 758.6 millimetres of rain between 1 and 19 August — 2.6 times the average for that time of year. The unusually heavy downpours caused rivers to overflow. Many of the fatalities were a result of landslides in rural areas, triggered by the massive downpours. Authorities say the floods are the state’s most damaging in 100 years. A contributing factor is that after the heavy rain, authorities began to release water from several of the state’s 44 dams, where reservoirs were close to overflowing. The neighbouring state of Tamil Nadu also purged water from its over-filled Mullaperiyar dam, which wreaked yet more havoc downstream in Kerala. Scientists say state governments often allow reservoirs to fill completely early in the monsoon season, and do not release water slowly at regular intervals to prevent overfilling later in the season. “India’s reservoir management is unscientific,” says meteorologist Madhavan Nair Rajeevan, secretary of India’s ministry of Earth sciences, which oversees the country’s meteorological institutes. Computer models and meteorological forecasts are used in Europe and the United States to predict the rate at which water flows into reservoirs and how much water needs to be stored — but few authorities in India use such systems, says Rajeevan. He suggests that prediction systems should be introduced across India. An increase in development over the past two decades in the Western Ghats — a large mountain range that runs parallel to India’﻿s west coast and across several states — might also have exacerbated the flooding, say several Indian scientists. “The land and soil disturbances have triggered landslides and blocked streams, contributing to the floods,” says Madhav Gadgil, an ecologist at Goa University. In 2011, Gadgil headed a committee that investigated environmental damage from unsustainable development and illegal mining in the Western Ghats. The committee recommended that the entire mountain range be declared “ecologically sensitive” — it contains 30% of India’s plant, fish, bird and mammal species — and that mining and the construction of dams and coal-fired power plants be banned to conserve biodiversity. But the government ignored the report’s recommendations. Instead, in 2013, it accepted the advice of another committee, which suggested that only 37% of the Western Ghats be made off limits to mining and construction. Gadgil says that the state governments have continued to approve infrastructure projects across the Ghats, including dams, power plants and buildings, many without reliable environmental-impact assessment reports. “There has been a proliferation of building and road construction, and supply of raw materials from nearby stone quarries,” he says. He says there’s also been an increase in illegal mining. Jason von Meding, who studies disaster risk reduction at the University of Newcastle in Australia, says the government should explain why it rejected the Gadgil-committee report, which emphasized the need to curb development excesses and focus on conservation. “Uncontrolled mining, dam construction, deforestation and poorly planned construction have multiplied the risk of flooding and landslides in recent years,” he says. Earth scientist Rajiv Sinha at the Indian Institute of Technology Kanpur also points to an increase in canals and bridges. These structures can reduce the width of rivers, leading to a buildup of sediment that slows water flow, he says. When there is a sudden downpour, there is not enough space for the water so it floods the surrounding area, “leading to disasters like the one we are witnessing in Kerala”, says Sinha. Heavy rainfall might have triggered the floods, he says, but the effects could have been minimized if the government had attempted to improve its understanding of river management. Sinha says India’s poor infrastructure planning will be exacerbated by the country’s vulnerability to extreme rainfall events, which are projected to happen more frequently as a result of global warming.